As the Archivist of this small college, I struggle a bit with the concept of an accurate picture of student life in any given era. I understand many things about student life in various eras and the photos in yearbooks are helpful, the Bachelor is a tremendous source and the Scarlet Yarns program of the Big Bash are all parts of the huge, multilayer puzzle that I try to assemble and share. Thankfully, it is an endlessly fascinating puzzle. But there are times when I come across something that shines a bright light on student life at Wabash. That happened this week…. While working in the 1950 yearbook I found a set of four images that I had never seen before. These four images tell the story of the school year 1949 to 1950 from the perspective of each class. This image shows the various activities of the freshman class. At the top they are busily building a bonfire for Homecoming, a serious responsibility. In the center a member of the senior council (in his Sphinx Club pot) is drilling the Rhynies on the words to Old Wabash and threatening a haircut if they blow it. At left are a pair of freshmen reading the infamous “Read and Reading Tremble” poster and we can see that they are indeed trembling. Almost the entire right of the picture tells us about class day…as summarized in this announcement from the Bachelor of November 11, 1949, “Thursday afternoon at 4:00 o’clock there will be held on Ingalls Field the annual Freshman-Sophomore Fight to determine whether Freshman Pots will be worn the remainder of the year. There will be three events, the Greased Pole Fight, the Tug of War, and the Two Mile Relay.” The far upper right shows the pots (freshman beanies) tossed in the air in celebration. This drawing show us the sophisticated sophomore class and their many interactions with the freshmen a year below them. All freshmen are shown wearing their freshman pots and many of them are at the mercy of the sophs. In the center is a caveman with his club, the Caveman magazine was a large part of student life at that time. I see a fellow at the right and wonder if that might not represent longtime faculty member Neil Hutsinpillar looking on with some disdain. Sophomores having fun seems to be the theme of this panel. This image shows the junior class and it seems all is in good order. We see students engaged in deep conversations, reading intently, checking the accuracy of the Milligan Clock and greeting old friends. The junior class seems to be at the height of student life, beyond the need for sophomoric exploits, not yet facing the challenges of the real world, in a word….relaxed. Here we have the senior class, the men of 1950. In the center at bottom, we see two fellows moved to tears at the thought of well, we don’t really know…leaving Wabash, leaving old friends behind or maybe facing their futures…We see a set of parents speaking to a member of the faculty or perhaps it is President Sparks. We see one young man who looks as if he is being sold a bill of goods by the man in the striped suit – or is this a job offer? There are so many characters in this image that observers from a later era don’t really know and yet the picture is so clear. This scene happens every spring as Wabash graduates another class. Each commencement we see these things, with a different class and a different cast of characters. What a great image! The artist behind these striking images is Don Cole [W1952]. Cole was on the Board of Editors of the Caveman and the only Caveman Artist in the 1950 yearbook. 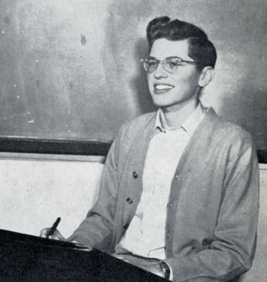 Here is a picture of the artist from the 1950 yearbook. Cole, as many alums know, gave Wabash the first Wally…in many ways, the one true Wally Wabash. Wally as created by Don was a gregarious fellow with a crew cut and a letter sweater. 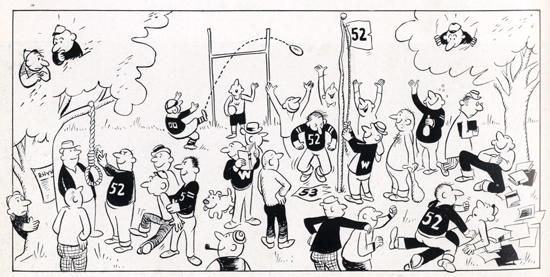 Don, as we can see from his work of 1950, even as a sophomore, was an incredibly talented cartoonist with a gift for finding the humor in a situation. 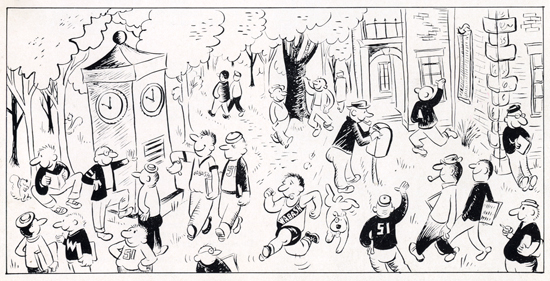 I love these four images and the snapshot of student life they give us for this particular year, 1949-50. I also love that 60+ years later, they are still fresh and full of life. They still have the power to bring a smile and they are a delight to share. While I enjoy reading all of your posts, this very well may be my favorite yet! Cole’s cartoons show a remarkable point in our College’s history, the “golden years” described in ‘These Fleeting Years’. 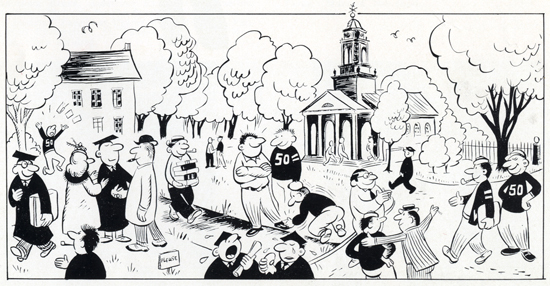 The amount of detail in each cartoon shows student life that is very different from today, yet still includes traditional landmarks such as Center Hall, the clock tower, and the Chapel. I may have to stop by the Archives soon to see this cartoons up close!